Tuesday night it was raining. Like really R-A-I-N-I-N-G, cats and dogs and all that. And my AC broke, which was unfortunate, as suddenly every surface of my car fogged up and the only solution was to create a sauna with heat blasting everywhere. Not the relaxing sauna experience you hope for, but a temporary solution as Chris and I drove to Detroit to do something kind of new. See, Chris is a classic car enthusiast, having owned almost 20 cars in his 13 years driving, all of which were made before 1978. Picture the Dukes of Hazard and you'll get a pretty good idea of what most of them looked (and sounded) like. Luckily Chris knows his way around cars, and actually likes them a lot with his heart, fixing them up and all that jazz, and then selling them to someone new (that man is quite the salesman - a master shmoozer, I call him - no one can say no to his charm). Unfortunately, older cars can break down, and if you're really lucky, all at the same time, leaving their owners car-less. And that's where this little jaunt to Detroit comes in. See, I think my beloved Lil Red (an endearing name given to my car by my Dad) has made quite the impression on Chris in our courtship, and so jumping on the Volvo-train was inevitable, I'm afraid. See, I come from a family of Volvos, and so they have my heart a little bit. And when Chris said he was considering buying one as his very first 'practical' (read: not cool, in man terms) car, my heart fluttered a little bit. I could just see it, our cars courting each other, having heartfelt conversations, getting their start and eventually falling in love just as Chris and I did. 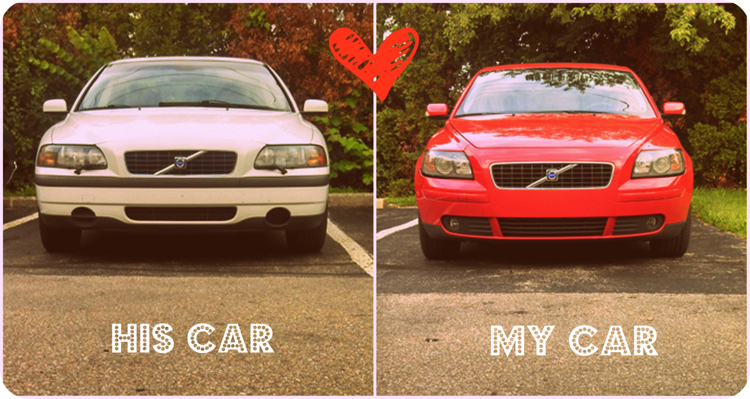 A Volvo love story! And sure enough, we went and met the nice gentleman who owned it, took it for a test drive (heated seats and a sunroof sure did sweeten the deal), and after some deliberation on Chris' part (which I try to stay out of, as he has a process - the master salesman, he is) he said "I'll take it!" I was in shock for all of 30 seconds, as he's never said that about a car that was built in this millennium, and then vicarious excitement kicked in. And oh, that sweet couple he bought it from! They were young, mid 30's we guessed, with two kids. The husband had bought the car for his wife as a surprise for their first wedding anniversary almost 10 years ago, and she explained it as kind of like those car commercials where the car just shows up in the driveway with the big bow on it. She loved that car very much, but new car opportunities were happening, and they needed the garage space. After Chris made the deal and was filling out paper work, getting keys and all of that, the sweet couple got sad at the impending goodbyes they'd have to say to their first car together. And then I got sad, because as a Volvo owner myself, I totally understand that - you think you'll have the car forever, and eventually give it to your kids and have it for 100 years (as Volvo's live for decades, after all). Being the softy I am, I offered Chris' car service to them, saying if they ever come to town, they can borrow it for the night which was awkward and kind of weird of me, but I was caught up in the moment! So they said their goodbyes, and Chris drove off with his new old car, and me in my old car, and there we were, driving down the highway, headed home as a new Volvo wolfpack. This is the most adorable thing I've ever seen/heard/read! I heart Volvos and can't wait to own one someday, although I can't survive without ac in autos. I did it for a summer with my old bmw... it was not a good hair summer to say the least.